Cryptic’s “Technical” Content Designer, Mike “Bicyclops” DiRenzo, for Neverwinter has taken to the official site to share details of the new skirmish that will release with the Heart of Fire module – the Manycoins Bank Heist Skirmish. The Zhentarim are planning an assault on the Manycoins Bank in Protector’s Enclave. They seek the fabled Stone of Golorr which is rumored to be hidden there by Lord Neverember himself. Neverember has enlisted the help of Acquisitions Inc. to protect the bank. Jim Darkmagic’s new unhealthy obsession with the Wand of Wonder could be a boon or a detriment. Can you defend the vault from vicious rust monsters and cunning Black Network operatives? DiRenzo shares that, as players enter, the Zhentarim will begin opening portals in random locations within the bank. 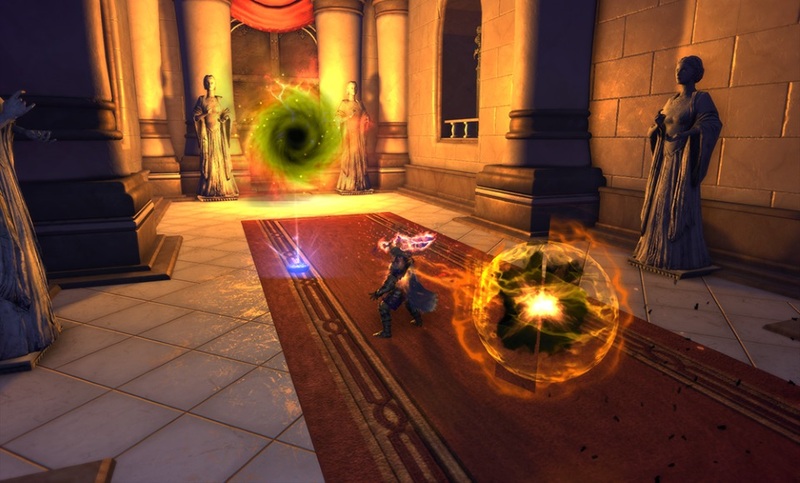 The skirmish will then be fought in three increasingly difficult stages (as the number of simultaneous portals escalates) and the skirmish will reward players based on their performance – mitigating vault damage in the first two phases and closing portals as quickly as possible during the third phase are the key goals.